Chef Knife Skills Part 4 - SHREDDING!! Whether in the kitchen or onstage, I'm a big fan of Shredding. :) But since this is A Cut Above Cutlery's Blog, let's stick with the kitchen application. Shredded or grated items can be coarse or fine, depending on the intended use. Foods can be shredded with a chef’s knife, a slicer, shredding tools and attachments, a mandoline or box grater. 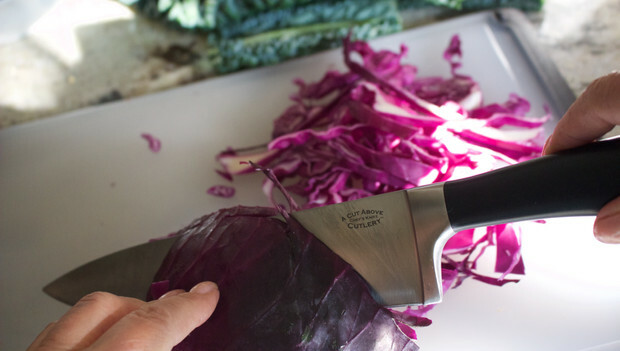 When cutting tight heads of greens, such as Belgian endive and head cabbage, cut the head into halves, quarters, or smaller wedges and remove the core before cutting shreds with your chef’s knife. The tip of the knife either remains in contact with the board as you cut or comes in contact with the board as you make a smooth downward slicing stroke. The blade’s edge rocks onto and off of the cutting surface with each stroke. To shred or grate larger quantities, use a box grater or a food processor fitted with grating disks. An electric slicer can be used to shred cabbage and heads of lettuce.